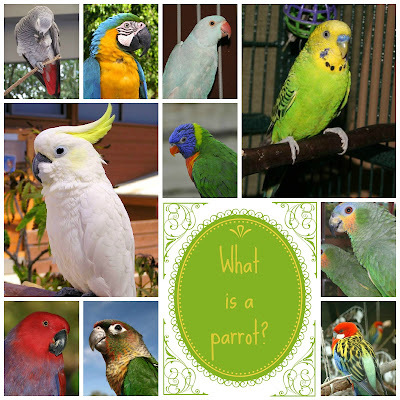 What Makes a Parrot a Parrot? When I say the word parrot, I'm sure most people are thinking large macaws and cockatoos. Yes, those types of birds are parrots, but there are small parrots too. You might be surprised to know that birds like parakeets and cockatiels are also parrots. Parrots range in size from very small to very large. So what exactly makes a parrot a parrot? A bird that belongs to the Psittacine order is considered a parrot. Psittacine is pronounced "sit-a-seen". An easy way to remember which birds belong to this family are the ones with "hookbills", which is another common name for them. Their beaks are shaped like a hook. Birds like canaries and finches have straight beaks and are not considered parrots. Besides their beaks, psittacines have different toes. They are called Zygodactyl toes. This means that the have two toes pointing forward, and two toes that point backwards. Birds like chickens have 3 toes that point forward and one that points backwards. Zygodactyl toes on a Goffin's Cockatoo. 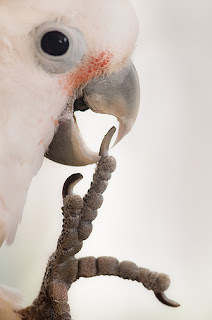 Psittacines also have extremely muscular tongues. They use their tongues to move food out of their mouth and down into their esophagus. This is important because parrots do not produce saliva and have dry tongues. This is a reason why they like to dip their food in water, causing a big water bowl mess. Parrots are intelligent animals that are very good at communicating. Most live in large flocks in nature. In the wild, they form strong bonds with other birds in their flock. Their ability to bond with others like this is one of the reasons they are popular pets. Many parrots can even learn how to talk or mimic sounds. Here is a list of common psittacines, most of which have several variations. So what's your favorite type of parrot? There are so many different types, it's hard for me to choose! We have macaws now in our park. They are everywhere on the outskirts of London. Noisy things but so pretty. Have a fabulous Friday. Wow, that's crazy! Austin has large flocks of quaker parakeets flying around here. I will say it at the risk of offending my Senegal and Hahns Macaw, that African Greys are my favorite. I just love their quiet intelligence. Hehe, Greys are great. They do pack a lot of personality! Yes, there are a lot of parrots that should probably not be kept as pets. So interesting. We had parakeets growing up and I loved them! Oh wow! Most names I had never heard of! Oh my gosh Charmaine! I never knew you had birds! You must share some pictures of them - I would love to see them all. Hi Ann, You come up with some really interesting animal information! I've learned a lot just reading your column. Thanks. Have a good weekend! I haven't been around many parrots and any of their relations, so it would be hard to choose which one is my favorite. But that is good information. I did not realize that a parakeet is a parrot. Makes sense. Have a great day. I love birds, and have owned a few over the years. So pretty, yet....messy. Hehe - thanks guys, hope you have an awesome St. Patty's day too! I agree with Loy, you have the best and most informative posts and I really do enjoy your blog, seriously! Don't tell anyone, but mom is kind of nervous about birds. But she really loves a book called Alex & Me about a very clever and famous African Grey. When I first started working with birds I was totally nervous! They are hard to read and their bites hurt lol. Plus, they seem so breakable. I got to be the technician for a board certified avian vet and I became the best bird handling tech at the clinic - now I love them! Very informative piece. Gramma used to have a hook nose. Wonder if she was a parrot. Hmmm. Lol, I thought you were saying your grandma had a hooknose for a minute... good one CK. My favorite by far is a parakeet. We had one when our son was small & he was a beautiful singer. When someone called on the phone they always commented on his beautiful singing. Pretty Boy. He was a beautiful blue. Sure do miss him. I also had a parakeet when I was in middle school. They are great little birds. Who knew there were so many different types! Very interesting. I like the really big ones that can talk! A hook bill does not make a parrot a parrot. If that was the case than, Eagles, falcons & hawks would be considered parrpts because they too have a 'hookbill'. Their beaks are different however. Also, raptors do not have the same type of feet. A hooked bill combined with zygodactyl toes and the other traits mentioned in the article are what makes a parrot a parrot. They are just sometimes called "hookbills". I did not make the name up, so I can't take credit for it. my favorites are, conures, quakers,mustache parakeets,parakeets,and cockatiels.